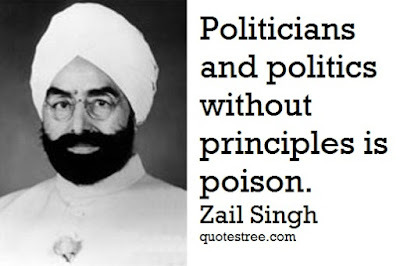 Gyani Zail Singh was the 7th President of India, serving from 1982 to 1987.Prior to which he served as Union Minister of India under Indira Gandhi regime. Dissent was not a crime but the opposition must appreciate the good actions of the government. Politicians and politics without principles is poison. Casteism, regional chauvinism, communalism and the custom of dowry were the greatest enemy of welfare and progress of the country. In anguish, I asked the prime minister what our intelligence agencies were doing all these months when the arms build-up was going on. And why action had not been taken to apprehend Sant Jarnail Singh Bhindranwale, the extremist leader. I asked her if any police officer had been taken to task for negligence of duty in allowing terrorists to smuggle arms into the temple [Golden temple, Amritsar] for almost two years. She had obviously no plausible answer. With a distant look in her eyes, she replied feebly that it was the duty of the Punjab government to take care of these aspects. All I could do was to ask the prime minister of the country not to allow the blood of innocents be spilled for the crime committed by two misguided security men. I asked Rajiv to be frank. I had no love for office or power. I could walk out any time. I was like a sojourner in an inn. No one actually brought me any money. But there were many commitments made...Chandraswami said he knows some Sultan. He wanted me to contest for the second time. Somehow, this fellow had a dislike for Rajiv perhaps because Rajiv refused to encourage him. At one stage, Venkataraman had agreed to become prime minister but he never told me this directly.... Once the news of his being in touch with the dissidents was leaked out, he was offered the presidency and that was the end of it. Towards the end of May 1984, Indira Gandhi mentioned nonchalantly that some people had suggested to her to send the police into the golden temple complex to flush out militants entrenched therein, but he was not exactly convinced on this course as it was likely to have an unfavorable fall out. But at the same time, she said she could not see any alternative. I seriously pondered over Mrs Gandhi’s thinking. I told her that this course would not be proper, as it would have serious repercussions. The entry of police into the complex was bound to inflame the public mind. Plausible alternatives could definitely be considered. She positively gave me an impression that she agreed to what I said. I tried my best to persuade her not to take any provocative step, but to adopt subtle methods to dislodge the armed men from religious places. Reflecting over this suggestion, she said that she would certainly apply her mind to other means, but did not disclose how her mind was working.